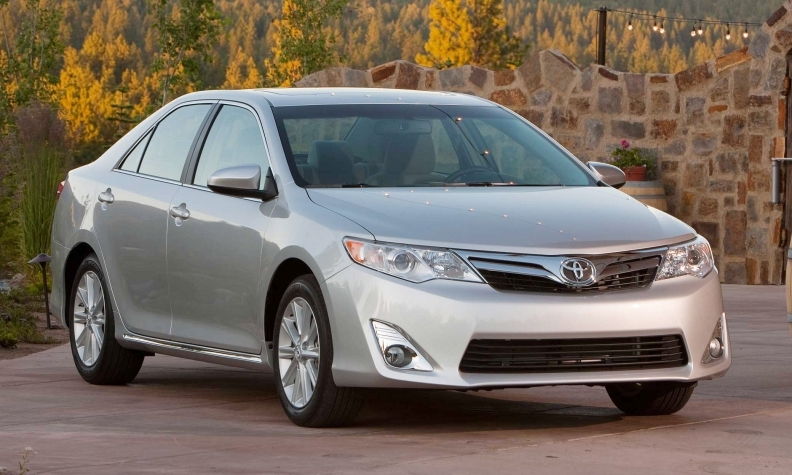 Toyota, led by the Camry, is expected to gain more U.S. market share in May. The automaker sold 142,225 Camrys in the United States during the first four months -- a gain of 33 percent over the same period last year. DETROIT (Reuters) - U.S. new-car sales look set to rise almost 30 percent in May, the biggest gain in more than a year but helped by a favorable comparison to weak results a year ago, according to research firms Kelley Blue Book and Edmunds.com. U.S. light vehicle demand slumped 4 percent in May 2011 to 1,061,841 units as the impact of the March 2011 earthquake in Japan began to disrupt car and truck stockpiles. The expected sales of 1,378,000 vehicles in May would translate to an annual selling rate of 14.2 million vehicles, matching January for the lowest pace of the year, Kelley Blue Book said. However, that would be the fifth consecutive month at a pace above 14 million, and well above the 11.7 million rate in May 2011. "During a typical post-recession recovery, we would expect to see auto sector gains being driven by broad economic growth," Kelley Blue Book senior analyst Alec Gutierrez said in a statement. "In the first quarter, the opposite was true, as auto sales were the primary driver behind GDP growth and have consistently been a bright spot in an otherwise slow-paced recovery. "At this point, it is almost as if the tail is wagging the dog." Edmunds released a similar forecast. "May overall looks strong," Jessica Caldwell, an industry analyst with Edmunds, said Tuesday during an interview in Detroit. "The big driver for the month will continue to be pent-up demand. If we can get those buyers into the marketplace, sales will sustain at a reasonable level." U.S. auto sales are on pace for the best showing since 2007. Sales this year may reach 14.3 million cars and light trucks, according to estimates from 14 analysts compiled by Bloomberg. That would be the best full year since 16.1 million in 2007. Edmunds last week estimated full year sales of 14.4 million. May's increase follows a 2 percent gain in April to 1.18 million, according to the Automotive News Data Center. The industry's seasonally adjusted annual rate, or SAAR, was 14.4 million last month. Auto sales are watched as one of the earliest snapshots of American consumer demand. In recent months, the sales figures have proven a bright spot in the U.S. economy. Kelley Blue Book credited the continued sales gains to an aging fleet of vehicles that is forcing consumers to buy replacements, improved access to credit and historically low interest rates, factors that will sustain demand. Sales results in May 2011 suffered because of the earthquake in Japan, which led to vehicle shortages for Toyota Motor Corp. and Honda Motor Co. Both companies have recovered. The research firm expects General Motors, Ford Motor Co., Hyundai-Kia and Nissan Motor Co. all to lose market share in May. It sees Toyota picking up more than 5 percentage points of share as sales almost double, as well as gains by Honda and Chrysler. Automakers plan to report May U.S. new-car sales on June 1. Bloomberg and David Phillips contributed to this report.